The WAC Veteran almost marches into the building after she pays her respect to the Pallas Athene statue guarding the entrance. She can’t contain her excitement when she sees that she and her fellow WACs have not been forgotten. Her tour is a slow one through the gallery as she recalls her decision to join and then her immediate panic of leaving her hometown. She recalls her various jobs and fondly recounts the good and bad points of her uniforms to a small group of young Army trainees also taking a tour. By the end of the visit, she is almost bursting with pride with the knowledge her service as a WAC blazed trails for today’s young women making the Army a career. A man comes in clutching an old cardboard box and looking somewhat lost. His mother served as a nurse in WWII and he came across her Service items when he was cleaning out her house after her recent death. The staff takes him in hand and walks him through the exhibits, answering his questions as they progress. When the son leaves, he better understands his mother, her Army service and is proud that her items found a new home at the museum. He plans to visit again and bring his family so they, too, can share the story. The mother and daughter are there for a bonding day. 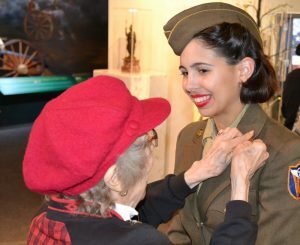 The mother has little experience with the military but thought that the museum would be a good place for her daughter to learn about women’s roles in history. She is hoping the visit will reinforce a sense of confidence in her daughter who is going through some growing pains at school. The pair discusses several of the women showcased and wonders if they could have done what these heroes did. When they leave, they comment about how inspirational the exhibits were and plan to do more reading. The mother is pleased with the afternoon of learning and the shared pride in being a woman. The Army trainees, young soldiers – male and female – just starting their careers — move into the museum as a large group. Part of their training is to experience the Army Women’s Museum along with classroom work. On the way in, a visiting veteran takes the opportunity to share a story from her time overseas. The trainees listen respectfully, joke around a bit with her, then file into the gallery. After their class, they have a greater appreciation for women’s contributions and are surprised since much of what they learned was not part of any school history lesson. Some are amazed at the heroics of the women in London during WWII and some by today’s opportunities compared to the early days. The female soldiers are most affected, realizing that today’s opportunities are because of the brave women that didn’t hesitate to join the various causes and give their service when our country was in need. One of them stops an old vet making her way into the gallery and quickly thanks her for her service, and then quietly slips out to join her class, smiling to herself. The museum is in the midst of planning the changes to the museum with a vision of the gallery being open and inviting. Galleries will follow the timeline of women’s contributions to this nation and will be expanded to provide not only the events but the context. 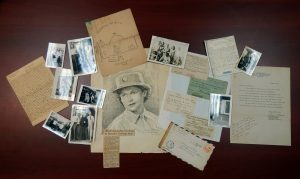 We are excited to be able to include audio and video content to bring alive not only the sight and sound of those periods, but the voices and thoughts of those women who served. Women’s contributions to the nation and specifically the Army continue and deserve to be celebrated. We believe the museum is a place that will evoke strong emotions and will make everyone say “I am home”.